This is one of my favorite preparations of this super healthy vegetable. The ginger-infused dressing lends a slight Asian touch to the dish, but I don’t take it too far into the Asian world. I think one of the ultimate keys in making this dish taste good is boiling the broccoli just long enough to soften, without turning to much. 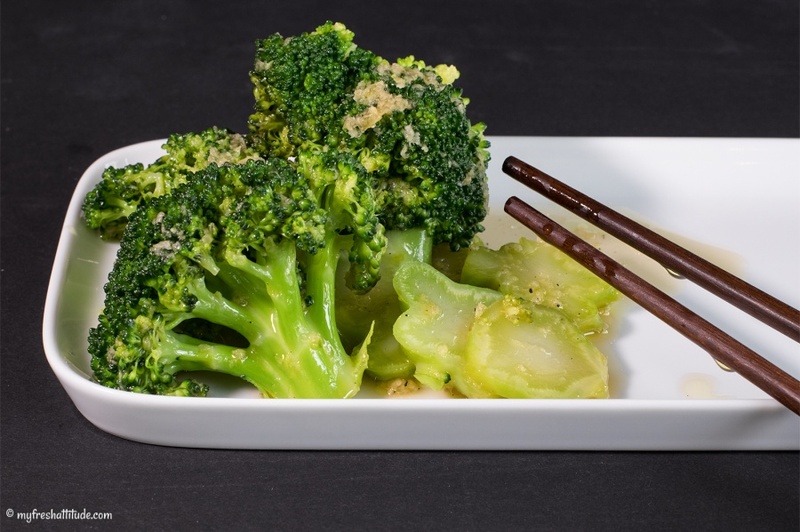 I don’t mix the broccoli with the dressing right away because the acid will compromise the beautiful green color of the broccoli and turn it slightly greyish. Instead, wait just until you are ready to serve the dish and apply the dressing either with a spoon or toss everything lightly in a bowl. I use broccolini (when I can find it) instead of regular broccoli for this recipe, because the entire vegetable is edible from the slender, asparagus-like stalks to the tiny florets. It’s both crunchy and tender, with a characteristic slight bitterness which matches nicely with the vinaigrette. Using regular broccoli is perfectly fine, though, as is young broccoli raab.